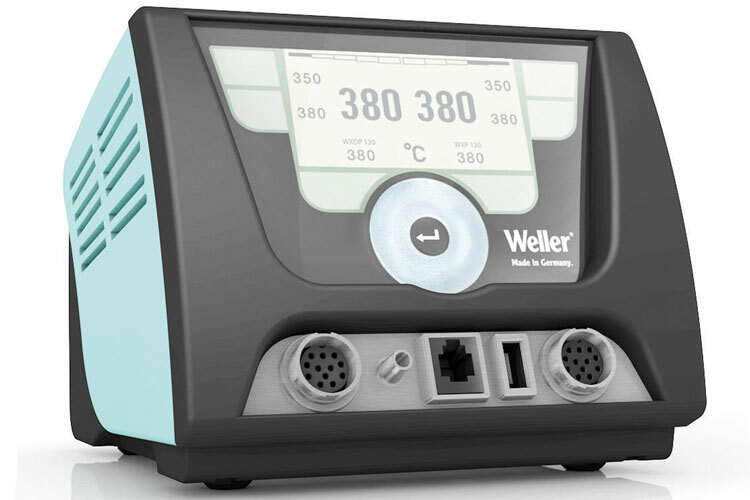 Weller WXD2 Solder and Desoldering Station is cost effective because only one station is needed and has less rework by optimal use of tools and the correct working temperature and due to a longer tip lifetime running costs are reduced. The WXD2 Solder and Desoldering Station is ESD-Safe and features equipotential balance, Intelligent tool detection, and unit data traceability aswell as a USB interface. The maintenance-free Venturi unit produces a constant vacuum using an external compressed air supply and with its 120 watts and extremely short heating time, the desoldering iron can easily handle jobs that would have been difficult in the past, including desoldering high mass PCBs. The new, extended nozzle shaft prevents the suction tube from sticking which means no tedious cleaning. The suction nozzle and solder cartridge can be changed quickly and easily without the risk of burns or tricky replacement work thanks to the relatively low operating temperature and automatic standby mode controlled by the use sensor. The WXD2 Solder and Desoldering Station is one of thousands of quality tooling products available from MRO Tools. Please browse Weller Solid Stations Performance Line for tools similar to the WXD2 Solder and Desoldering Station. WXD2 Solder and Desoldering Station description summary: Weller WXD2 Solder and Desoldering Station. Dimensions: 6.69'' x 5.94'' x 5.12'' Channels: 2 Voltage: 230V Heating Output: 200W Temperature Range: 150F-999F(50C-550C) Temperature Accuracy: 17F(9C) Temperature Stability: 4F(2C) Quantity discounts may be available for the WXD2 Solder and Desoldering Station. Please contact MRO Tools for details.